Intelligent Supply Chain Solutions & Services | ACSIS, Inc.
We’re helping organizations like yours thrive with responsive, agile, and innovative information to run your digital supply chain. ACSIS Cloud Solutions for the Intelligent Supply Chain connect local, regional, and global networks for a real-time view across the supply chain. We help you transform data from edge devices, legacy systems, and new technologies into the actionable insights for more strategic decision-making, new efficiencies, and higher levels of service. For end-to-end product visibility that helps your business master supply and deliver superior customer experiences. To connect partners across your operating ecosystem for a more transparent and agile supply chain. For dynamic, on-demand label execution and governance at all points across your supply chain. Organizations adopt serialized data for lots of reasons: to comply with industry regulations, to control counterfeiting and theft, to manage returns and recalls more efficiently, and to gain strategic insight into the extended supply chain. 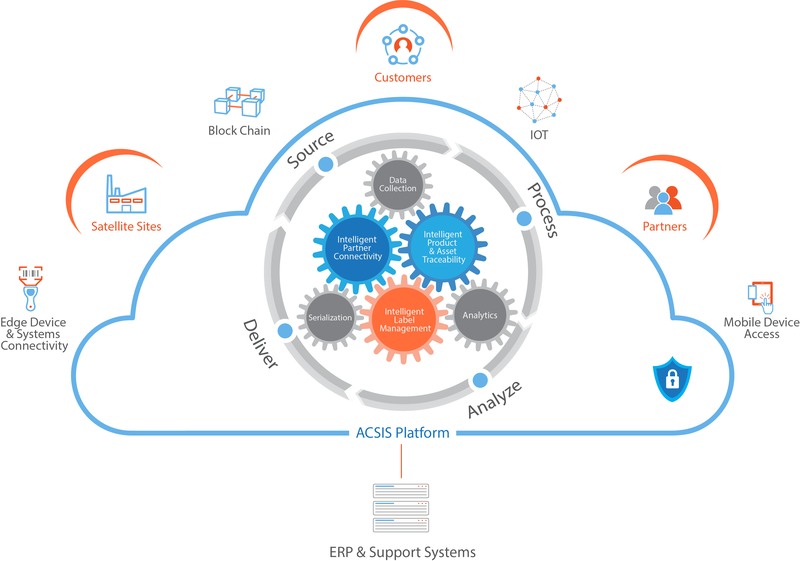 With ACSIS Cloud Solutions for the Intelligent Supply Chain, you can incorporate serialization at any level and connect that data across your supplier ecosystem–from the enterprise to the edge–integrating EPCIS providers and other regulatory and business systems for seamless and secure data exchange. Contact us to explore your serialization needs. In a world dominated by lean inventory practices, volatile demand, and a growing focus on risk mitigation, organizations are seeking better ways to understand–and control–how products and assets move across the extended supply chain. ACSIS Intelligent Product and Asset Traceability tracks the movement of products and assets at any point in the supply chain. With our cloud-based solution, you can exchange data with partners and suppliers in real time for complete end-to-end traceability. Leverage the cloud to exchange data about products and returnable assets in real-time to improve speed, scalability, and performance. Actionable analytics to ensure issues in production do not become problems. ACSIS was selected because the end-to-end solution proposed offered a more efficient and more reliable data collection solution that: Assured seamless integration with the new SAP platform; Allowed operations when the SAP system or the wide area network was unavailable; Provided a store and forward platform to manage the data until the SAP service was available; and could be leveraged easily and cost-effectively at each of the division’s other plants. Returnable Returnable Transport Items (RTIs) play a critical role in your supply chain operations–enabling the safe, secure, and efficient transport of goods and materials–some of them highly volatile and costly. Today’s RTI assets have an estimated annual shrink rate of 25%. With RTI fleets in the thousands–even millions–how do you track and maintain items across a complex supply chain so that they can be easily returned, redeployed, or recalled? Cloud solutions from ACSIS Inc. can help extend your ERP system give access to customers, partners and other third-parties to information about the RTI assets in their control. ACSIS solutions provide real-time connectivity across your extended supply chain, integrate RFID and pen marker technologies, and delivering insightful analytics for optimized understanding production, inventory, and maintenance. requirements. Your business depends on your partners. Your customers depend on you. For your partners to deliver great customer experiences, they need to align seamlessly with your priorities, standards, and processes. But without the insight you need to respond quickly to shifting demands, you and your partners can miss the mark–and those mistakes can be costly. ACSIS Intelligent Partner Connectivity leverages the cloud to connect partners with timely access to the information they need to deliver to the highest standards. With real-time visibility and integration, partners can work better to manage demand, communicate consistently, and collaborate more effectively. ACSIS Partner Management connected over 125 value-add partners to the DuPont SAP system to enable end-to-end supply chain visibility with the use of a simple, menu-driven web-based interface. Labels are getting smarter. The smartest can improve how fast, how accurately, and how reliably your products and assets move across the extended supply chain. With embedded intelligence, labels can do more than identify what’s in the box–they can help organizations speed delivery, control inventory, meet rigorous compliance standards, and monitor and analyze performance across the supply chain. ACSIS Intelligent Label Management delivers next-generation capabilities to your enterprise and its extended supplier network. You can transform your labeling strategy by putting the power of label execution into the hands of your suppliers and still retain governance and control. The result? Streamlined processes, decreased time-to-market, consistent label usage. At ACSIS we deliver and stand behind our solutions with a services team of experts reflecting 25+ years’ experience in the industry and a support team that is available 24x7x365. Together their job is to help you succeed in yours. The ACSIS Services team works with your team to deliver a personalized solution that fits your operating process and is there as your needs evolve. The ACSIS Customer Support personnel are technical specialists with a deep understanding of our solutions and hardware providing stellar levels of service and support to keep your solution delivering value and improve the solution experience for every customer.